Our joined service with Yopal via skype was fun. We prayed and sang together, took turns in the readings, and shared the Peace bilingually. God is good! The congregation has an official name now, too: Santiago Apostol. Blessings!! Come and join us this Sunday, April 6, at 10AM for a joined worship service with our brothers and sisters in Yopal via skype! It will be singing and praying in Spanish and English, and it will be great fun! Felicitaciones!! Today Nelson Celis was ordained as pastor! May God continue to bless Nelson, Claudia, and the people of the Lutheran Church in Yopal!! What is your favorite dish? We are going to have an exchange of recipes with the congregation in Yopal. Please give the recipe(s) including cooking instructios to any member of the Colombia team. They will be compiled and sent off soon. Today we received Christmas greetings from Yopal. And we sent a little video message back. What a blessing this partnership is for us! Feliz Navidad and Merry Christmas to all! We are all set! On October 27 we will meet with the congregation in Yopal! At the beginning of our service at 10AM we will connect over skype and sing our song together (You have come down to the lakeshore). Some of the people of Yopal might stay on for the rest of the service. This is exciting! The children of Yopal are involved in making connections with us as well: Yesterday, Criastian Roja's picture was posted on their blog in which he expresses his hope for a growing friendship between the two communities, using Jesus' words in John 13:34: I give you a new commandment, that you love one another. Just as I have loved you, you also should love one another. Please check this out. The plants in the picture were a gift from Joyce and Mark from Ascension when they visited the Lutheran Church in Yopal in the summer. They are a symbol of our growing friendship. May God bless and nurture our friendship as it grows and becomes stronger! The congregation has a blog, too. Check it out! luteranayopal.wordpress.com (It is all in Spanish but google translate helps a lot!) 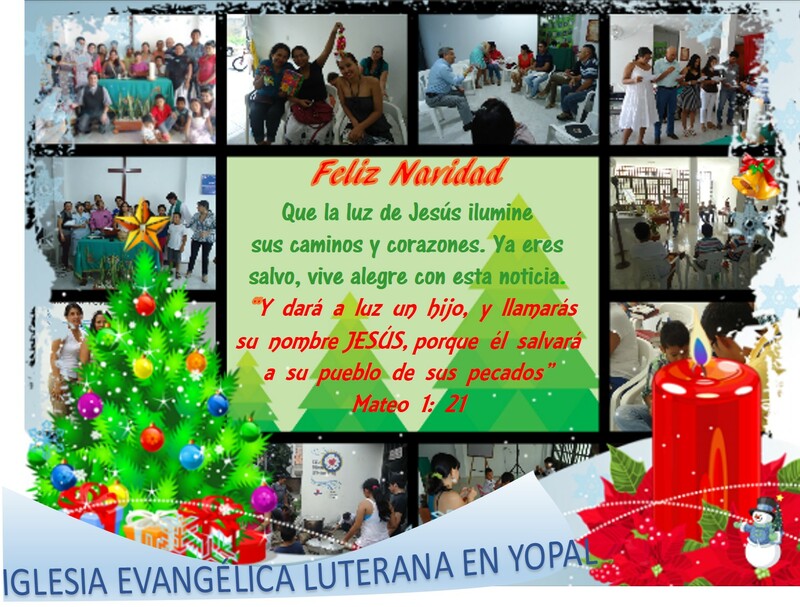 They also have a facebook group that we can join: “IGLESIA EVANGÉLICA LUTERANA EN YOPAL”. What are other ways that we can connect with the people of this congregation and show our love and support for them?